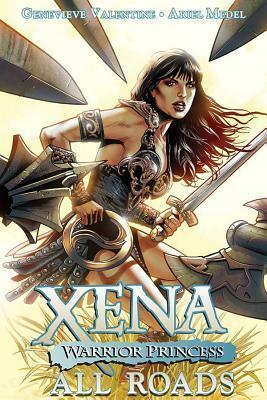 Collects issues 1-6 of Xena: Warrior Princess volume 2. This limited series is set during season 6 when Xena and Gabrielle have already faced Rome and the current Caesar, Augustus, has made Xena into a champion of Rome, at least in bards’ tales. Xena and Gabrielle team up with a group of fierce female warriors to combat Rome’s cruel ways. It’s very much in the sprit of the show, although it’s made clear that Gabrielle and Xena are more than friends (which the show didn’t). I liked the first artist more than the second one. The shift was in the middle of fourth issue and it felt quite jarring to me since the styles are quite different. There’s some unnecessarily revealing female “armor” but no more than is usual to the show. I didn’t love the comic but liked it quite a lot, especially because it includes our heroes going undercover (which on the show I either loved or cringed through one episode and never watched again). Recommended to fans only. The sixth collection of Busiek’s superhero comics, issues 1-4 of Book one and 1-4 of Book two. 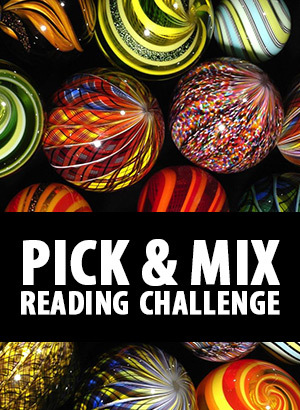 It doesn’t require reading the previous collections. 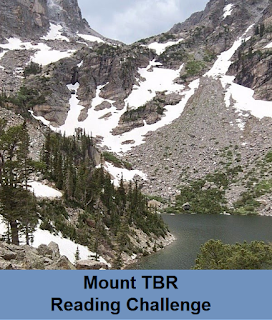 The comic is divided into two books and both have several storylines. One follows the brothers’ lives and the other shows us the various heroes and what little we see of their adventures. When they grow up, Charles becomes a police officer who tries to save and help people, especially in the devastating wake of the battles between super groups. But Royal becomes a petty criminal, taking advantage of people in any way he can. Neither of them likes superheroes much; they both cope in their own way with the disasters the heroes (inadvertently) bring to the human bystanders. In the first book, the other storyline tells us the tale of Silver Agent who appears to have been one of the first superheroes. He’s caught on camera killing a foreign head of state as well as a few US soldiers. The book is set in 1972, so this incident throws the Vietnam peace talks into chaos and the US government arrests the Silver agent. Watergate and the peace talks color people’s perception of super heroes who make ordinary people, as especially their leaders, feel powerless and therefore resentful. The second book is set in 1977 during a war between various mobster gang in Astro City. Royal gets a chance to climb the mobster ranks and Charles’ integrity gets a mighty blow when he finds out about police corruption. The superheroes are also grittier. Some of the new heroes kill ordinary criminals, something that the previous wave of heroes didn’t do. The super hero storyline follows Street Angel and his new partner Black Velvet. Street Angel transforms into far more violent hero and Black Velvet can actually rip out people’s souls, so she’s violent to start with. Also, a new superpowered being hunts and kills ordinary criminals. People start to wonder just what is the difference between heroes and villains. This isn’t a self-contained album, though. The brothers’ tale will continue in the next collection: book 7, Brothers in Arms. Astro City showcases superheroes in a more ordinary setting than usual. They’re seen through the eyes of normal people who often don’t know what’s going on and are still victims of various large-scale attacks. Their attitude also changes with times and events. Nixon turns attention from Watergate to Silver Agent’s trial and the racial tensions are seen also among the heroes because there are very few non-white heroes and also very few female heroes, usually just one in a team. (yes, I know this book’s style deliberately first shows us the heroes of 60s and then 70s. But we did get Storm and Ms. Marvel in the seventies and I miss heroines like them. Maybe in the next book… Then again, we do get glimpses of several white female heroines while there seems to be only two black heroes in the whole story.) It was fun to compare the idealistic 60s heroes with the “tougher” (seeming) revenge based 70s heroes, though. Personally, I tend to enjoy the four-color comics more, especially when they have more female and non-white characters. But this is very ambitious and well-told tale of grittier superheroing than usual. 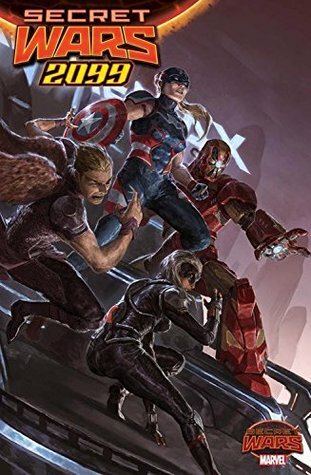 Definitely recommended for people who want more realism in superhero stories. Collects issues 1-18 of the digital comics. This is an alternate history story where the world is still embroiled in WW II. Many men are off in the war and so women have taken up their roles. 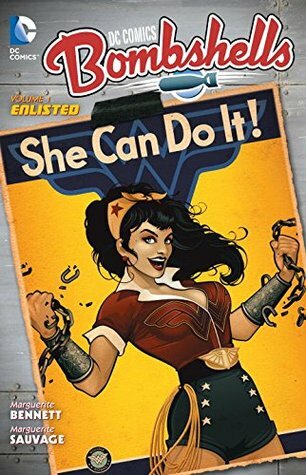 The majority of heroes (and villains) in this story are women, reimagined into 1940. Gotham is defended from muggers by Batwoman who is billionaire Kate Kane who lives with her lover detective Maggie Sawyer. Then commander Amanda Waller recruits her for the war effort. The Batwoman goes undercover in Berlin. Meanwhile, near Greek coast Steve Trevor is fighting Nazi warplanes. He sees a group of women attacking all planes and his fighter goes down. The Amazons take him prisoner but their Princess Diana is interested in the news Steve brings from the outside world: of a great war where millions of people are being killed. The Amazons aren’t interested in the war and indeed their queen is going to execute Steve. But Diana together with her friend Princess Meru from Atlantis free Steve. They want to help fight the Nazis. In Russia, Kara Starikov and Kortni Duginovna are part of the Russian female elite pilots, the Night Witches. However, on their first mission, Kara’s plane is destroyed and she’s forced to show her great powers. The Russians take her prisoner. In exchange for the lives of their parents, the girls agree to become figureheads for the Motherland: Supergirl and Stargirl. In Berlin, Joker’s Daughter and Zatanna are preparing to bring about something monstrous to help the Nazis. This is a very interesting reimagining, with many, many female characters. Big Barda is part of Waller’s organization. However, the story has lots of storylines, which makes it a bit fragmented. However, I’m sure all the storylines will join near the end. Personally, I would have liked to know the characters more and more about the world. Now we get quite short scenes with each character focusing heavily on the plot. Zatanna is an interesting, conflicted character. She’s the daughter of a Jew and a Romani. So, Joker’s Daughter is essentially blackmailing her into working at the club and with the magic. Meanwhile, Diana, Mera, Kara, and the rest are very straightforward heroic people. Despite having lots of artists, their styles actually seem pretty similar, so I didn’t have a problem with the art. This is loads of fun! The only section that didn’t work for me was the Harley Quinn one, others I quite enjoyed, even if the art is rather cheesecakey. Collects: Strange Tales V1 #110-111 and 115, Dr. Strange V1 #172-173, Marvel Premiere #10, Tomb of Dracula V1 #44, Dr. Strange V2# 14 and 50-51, Dr. Strange Sorcerer Supreme #48-50, Dr. Strange The Oath #5, Dr. Strange From the Marvel Vault. This collection showcases Dr. Strange stories through the decades, from the very first stories to 2011. The first two stories are from Strange Tales by Lee and Ditko. They’re only four pages long each. The third story is the good Doctor’s origin. Right from the start, Strange battles his bitter foe Baron Mordo. Also, the doctor’s origin story has stayed the same: it’s the same story we got in the movie. I’m actually not very familiar with Dr. Strange. I’ve never read his own comics so I’ve seen him mostly in team-ups and huge crossover events where he’s often been integral with planning and/or required magical aid. So, it was very interesting in seeing him on his own. He doesn’t seem to have a huge cast of characters around him (like Spider-Man). Instead, he only relies on himself and his abilities or trickery. His abilities are granted by cosmic entities, such as Vishanti or Ikonn. The few people around him, like Wong and Clea, often require his help. In the first two-issue story (172-173) he battles Dormammu and Dormammu’s sister Umar while his love interests Clea and Victoria have been kidnapped and are held hostage. In the next story (Marvel Premier 10) Shuma-Gorath forces Strange to kill his mentor, the Ancient One. In the next two issues, Doctor Strange battles Dracula. The story starts with Wong’s death but, of course, he doesn’t stay that way. In the next two issues, Dr. Strange travel through time to WWII. Baron Mordo kidnaps Clea and Morgana Blessin so the good doctor has to follow him. Nick Fury guest-stars. Next is a three-issue story where the entities from whom Dr. Strange have gotten his powers from, want something back. Specifically, first Vishanti and then the others want Strange to lead their armies in war. Unfortunately, they estimate that the war will take about 5000 years. Strange declines and has to denounce their aid. However, at the same time, Dormammu and his sister are again up to no good and Strange has to call for Hulk, the Silver Surfer, and the Ghost Rider for help. The Oath issue 5 is apparently the last issue in a mini-series where Dr. 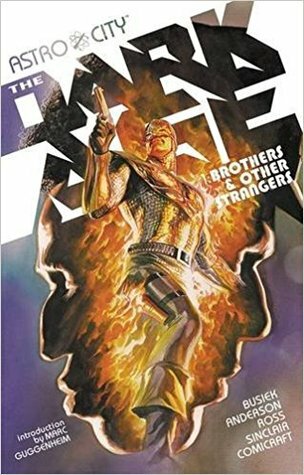 Strange battles another student of Ancient One’s while Wong’s life hangs in the balance. He also has a new love interest, the Night Nurse. And the final issue brings us back full circle to the day when Strange first sees the house which will be his sanctum sanctorum. These are pretty interesting stories and easy to follow even though I haven’t read the rest of the stories. Some plotlines are left dangling but nothing significant. No doubt some of these stories, especially the death of the Ancient One and denouncing the aid from the entities, were turning points for the series. But that’s hard to appreciate in this collection. 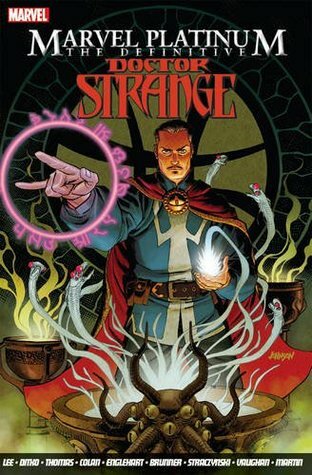 Recommended for people wanting to know more about Strange. Collected the miniseries issues 1-5. In this 2099 world, the megacorporation Alchemax owns the rights to all super beings. If a super being doesn’t work for Alchemax he, she, or it is, by law, a super villain. The head of the company is Miguel Stone. The Avengers include Captain America (Roberta Mendez who has been brainwashed so that she doesn’t remember being the Cap while she’s Roberta and vise versa), Hercules (the original but with a depression and a drinking problem), Black Widow (who is a seductress with so spider powers), Iron Man, and Hawkeye (who has real wings and talons instead of a bow). They also have the Vision but she’s a woman in a tank who sees visions. Someone sends assassins after Roberta and that someone seems to be Martin Hargood. The team goes to arrest him but another super team is already trying to question Hargood, the Defenders: Hulk, Silver Surfer, the new Dr. Strange, Sub-Mariner (blue-skinned Roman), and Valkyrie (Brunnhilde). Of course, they fight. This one was fun and the new Cap was very interesting. Pretty light stuff, though. There’s a subplot about the Black Widow but it didn’t go anywhere. I’ve read some of the 2099 titles years go and it was fun to revisit them. Doesn’t affect the main story at all. Collects the Secret Wars tie-in miniseries issues 1-4 and Uncanny X-Men 270. Years after the X-Men, X-Factor, and New Mutants defeated Cameron Hodge at Genosha, some former X-Men are still in Genosha. But they aren’t trying to rebuild anymore. Now, they’re trying to keep the desperate population alive. A mutant plague is threatening every mutant on the planet. It started at Genosha and so Baron Rachel Grey, host of the Phoenix Force, is keeping Genosha under complete quarantine. Havok, Wolfsbane, Rictor, Karma, Mystique, Chief Magistrate Anderson, and a group of new characters try to appeal to Emperor Doom for help and when that fails, they try to appeal to Baron Grey. Havok and the others have come up with a plan: Rogue and Triage, a mutant with a healing ability, should be able to cure the plague. But Rachel thinks the risk of the plague escaping to the general mutant population is too high and she refuses to help, except by sending more food and medicines. So, Havok and his team decide to break the quarantine and kidnap Rogue and Triage. X-Men battle X-Men! Meanwhile, Genengineer (you know, the bad guy who invented the ways to enslave mutants and make both mutants and potential mutants into mutates. And you know, the X-Men are actually trusting this guy to run the science labs without even a hint of supervision???!!!) actually has quite another plan. The plot depends on characters making terrible choices. Beast is at his worst, advising Rachel Phoenix to not help the others based on calculations. Even ghost-Cyclops warns Havok not to do this. I’m also not so sure that the small team should have been able to fight successfully against a large team of X-Men plus Phoenix and win. Of course, after the kidnapping, a group of X-Men pursue them to Genosha and another fight happens. A shame, because I actually found the background stuff far more interesting than the actual plot. Like, Beast has done his time-travel thing again and rescued a few X-Men from death, by bringing them to the present before their death. But despite Rachel being the Baron and her parents (apparently) dead, Beast has brought back Wolverine, Thunderbird, and Banshee. Also, Rogue’s powers seem to work differently: the person whose powers she absorbs, stays conscious so both Rogue and her “victim” can use their powers. The new character, Wicked, has the power to call ghosts which seemed pretty interesting. The X-Men in Genosha also seem to be far less intelligent than usual, since they’re trusting Genengineer. 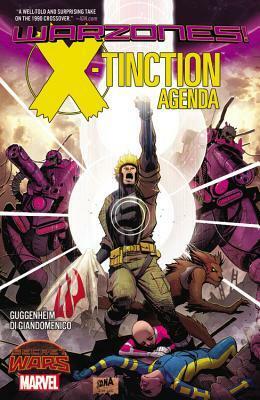 Apparently, the print collection also has the first issue of the original X-Tinction Agenda which ends in a cliffhanger. I’ve read the Birds of Prey comic for some years and when I bought the newest version (Batgirl and the Birds of Prey) it was time for a reread. Despite her prominence in the cover, the Huntress is in only one story, the last one. 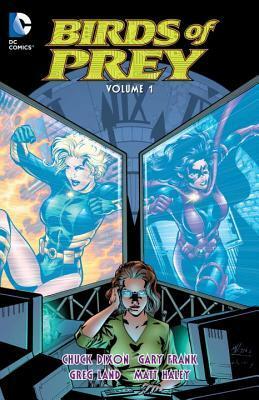 These are the very first stories where Barbara Gordon, as Oracle, and Dinah Lance, as the Black Canary, work together. In the first story, Dinah’s life is a mess and Oracle actually saves her by recruiting her to get close to multi-millionaire Nick Devine. Apparently, he helps African countries to get high tech and become wealthy and has become himself quite wealthy, too. But recently, his efforts have been undermined by eco-terrorists. He’s a notorious womanizer but Dinah manages to get hired as his bodyguard. However, he already has a bodyguard, Lynx who is the queen of Gotham’s Chinese mafia. She’s not happy to see the Canary. Things get more interesting when Nick takes both Dinah and Lynx with him to Bwunda. In the next story, Oracle sends Dinah after a white slavery ring. The job takes Dinah to the Caribbean and a small island paradise Santa Prisca. In this story, Barbara and Dinah disagree enough that they discontinue their friendship. However, in the next story they’re back together. Lois Lane and Dinah are both investigating a slaver place in US. They bond over their romantic troubles. In the final story, Manhunt, the Canary is after Braun, a former one-night-stand who turned out to be a criminal. Huntress is also after him because he made her fall in love with him and the dumped her without a word. The Catwoman is after him because he didn’t pay her. Against Oracle’s advice, Dinah teams up with them. Barbara has been paralyzed from the waist down. She’s a wizard with computers and directs Dinah through earpieces. She’s very analytical while Dinah is quite passionate and rash. (In fact, I don’t think Dinah was this rash in the JLA.) But she’s also very good at crimefighting. Of course, she has been the Green Arrow’s partner for years. I mostly enjoyed these comics but they aren’t the best Birds of Prey stories I’ve read. I also really enjoyed the small reminders Barbara has in her office that she was Batgirl. However, all of the women are very sexualized in the art. In the final story, the women’s motives were exceptionally weak. They also talk a lot about their former boyfriends and bond over how they were dumped. I don’t think that male superheroes do the same, except maybe Spider-Man. While this a superhero comic none of the main characters have any superpowers.